A few weeks ago, I had written about the importance of knowing the roots of the graffiti movement in reference to some early films from the 1980s which had documented the start of graffiti in NYC. Usually once I write something, I get it out of my system (at least for a little while). However, despite my efforts to lay off the subject of graffiti and return to street art, my mind has kept wandering back to the topic of early graffiti and its development. For this, I blame the 7 train. For those of you who aren’t native NYCers, or have never ridden that particular line, the 7 is an elevated train that runs through northern Queens. Not only does it pass the legendary graffiti mecca 5 Pointz (a warehouse located in Long Island City), but as I ride the 7 train every day through Corona, I see a lot of old-school graffiti styles, ranging from scrawled tags to latex rolling to stylized pieces. Maybe this is why I can’t stop thinking about the development of graffiti, the appeal of tagging, issues relating to destruction of property, and the implications of anonymity in graffiti (the last of which I will discuss in a future article). However, despite what is still exhibited along the 7 line, graffiti has evolved immensely since it first swept NYC in 1970. It no longer solely constitutes the idea of simply getting ones’ name out there (often termed “hitting,” “bombing,” or “tagging”), but has come to represent an entire genre of urban expression. 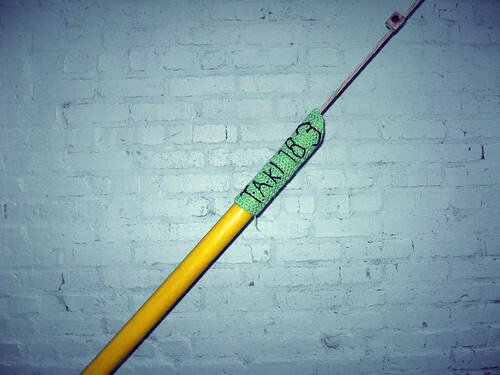 In the 1970s, the name that started it all was TAKI 183. Almost overnight, his simple scrawl produced imitators across the five boroughs and gave birth to the first generation of modern graffiti in New York City. While not the first writer in NYC, TAKI 183 quickly became all-city due to his job as a messenger, and by the end of his short career had successfully hit stations in all five boroughs. By 1971, the New York Times had picked up on this burgeoning phenomenon with the article “TAKI 183 Spawns Pen Pals,” which brought the now widespread urban phenomenon of graffiti to the attention of the mainstream in a largely nonjudgmental manner. Only a few short years after TAKI 183 began bombing the train stations, competitive creativity soon saw the development of stylized writing, including new lettering and design elements. By the 1980s, large, colorful, and stylized pieces (called “wildstyle,” “burners,” and later, “abstract graffiti”) with multiple creative design elements, such as clouds, arrows, perspective, and 3D lettering, had emerged onto the scene. 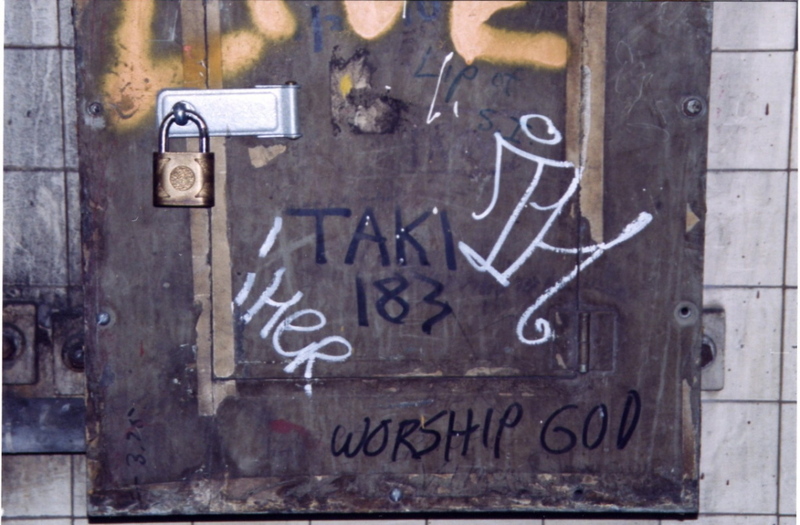 If TAKI 183’s tagging were to be considered the start of the modern graffiti phenomenon, this development of stylized graffiti could be termed the second generation of graffiti. However the change was not only in the aesthetic stylings of the work but the mindset of the writers, who were less concerned with just getting their names out there to the general public than they were with creating complicated and intricate designs to gain respect and become known specifically within the graffiti-writing community. Despite the respite caused by the sweeping laws and heavy penalties set in place by former NYC Mayor Ed Koch in the late 80s, graffiti and street art returned full force by the late 90s. Currently, we are in what I consider the third generation of graffiti, aptly and commonly termed “street art.” This term usually includes more of (but isn’t limited to) wheatpasting and stenciling. Oftentimes the focus is more on spreading ironic, playful, or socio-political messages or to utilize previously neglected elements of the public landscape with artistic intent. 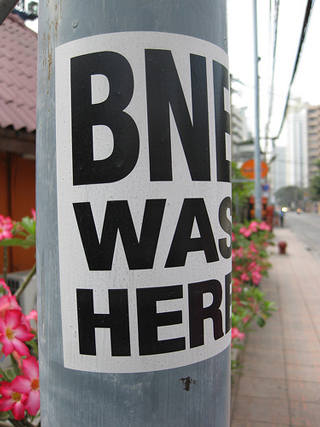 Not only has the ease of sticker-slapping helped BNE to quickly and effectively disseminate his name on the street, but the uniformity of the print on a sticker has helped BNE create an easily recognizable logo, which is the point of his campaign. 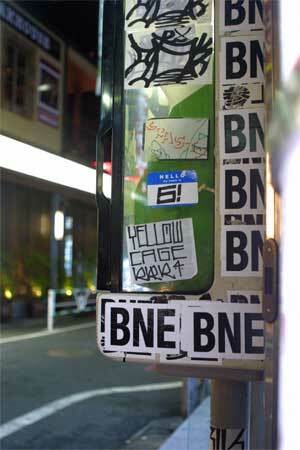 Using the font of Helvetica Nueu Condensed, BNE’s stickers are often misinterpreted as official intrusions into the visual landscape. And indeed, the argument can be made that they are using otherwise unutilized spaces to create visual stimulation. While my thinking tends to be that it is nothing more than juvenile egomania that compels taggers to write their names over ever available surface, the argument can also be made that the way these bombers have created their own logos and saturate the landscape is just another way to rebel against the consumer culture. These days, we are so bombarded with visual stimulation that our eyes tend to slide from one image to another, whether it’s corporate or guerrilla. At the end of the day, they’re all just logos competing for our attention. The only real difference being that taggers aren’t trying to sell you something. So, if that is the case, why does it matter whose logo we’re seeing if it’s all visual pollution in the end? Taggers and sticker-slappers like BNE are bringing graffiti back to the roots that TAKI 183 had originally intended because the idea behind first generation style graffiti was to be everywhere, and to be instantly recognized by your moniker. Can actions such as tagging, rolling, and sticker-slapping be considered art? I would say definitively that no: these forms of getting up usually so not constitute art the same way that company logos don’t constitute as art. Most first-generation graffiti is about proliferation of the name more than it is about style. Now don’t get me wrong, I sympathize with owners and managers of private property who have to deal with the shenanigans of those who decide their name is important enough to go anywhere and everywhere, whether it’s wanted or not (but isn’t that what legal ad campaigns do as well?) and I am by no means an advocate of tagging. However, both tagging and stickering definitely constitute a significant part of our urban visual landscape, which makes it worthy of mention here.